After president accused former strategist of 'losing his mind', Steve Bannon says he still backs Trump 'day in day out'. Former White House advisor and 2016 Trump campaign strategist Steve Bannon struck a reconciliatory tone Wednesday night, hours after President Trump eviscerated him for a series of alleged quotes attributed to Bannon in an upcoming book on the first year of the Trump presidency, Michael Wolff’s Fire and Fury: Inside the Trump White House. On Wednesday, excerpts of the book, written after Wolff was granted access to the White House in the early months of the Trump administration, were adapted into a New York Magazine piece. The article included claims that Bannon had accused Donald Trump Jr., the president’s son-in-law Jared Kushner, and then-Trump campaign chairman Paul Manafort of “treasonous” and “unpatriotic” behavior in 2016 by meeting with a Russian lawyer who claimed to have information regarding collusion between Hillary Clinton and a foreign government. The source of the quote was never disclosed, and the White House pushed back on the book, calling it “tabloid trash”. Nevertheless, later on Wednesday, President Trump released a blistering four paragraph response to Bannon, claiming that he had “lost his mind” after he left his position at the White House in August. “When he was fired, he not only lost his job, he lost his mind. Steve was a staffer who worked for me after I had already won the nomination by defeating seventeen candidates, often described as the most talented field ever assembled in the Republican party. Now that he is on his own, Steve is learning that winning isn’t as easy as I make it look,” Trump continued. “Steve had very little to do with our historic victory, which was delivered by the forgotten men and women of this country. Yet Steve had everything to do with the loss of a Senate seat in Alabama held for more than thirty years by Republicans. Steve doesn’t represent my base—he’s only in it for himself." “Steve pretends to be at war with the media, which he calls the opposition party, yet he spent his time at the White House leaking false information to the media to make himself seem far more important than he was. It is the only thing he does well. Despite the harsh statement, Bannon expressed his support for Trump Wednesday night, telling SiriusXM’s Breitbart News Tonight that he won’t turn against the president over their personal spat. Following his dismissal in August 2017, Bannon and Trump endorsed opposing candidates in a hotly contested Republican primary for an Alabama special election to fill the vacancy left by Attorney General Jeff Sessions in the Senate. 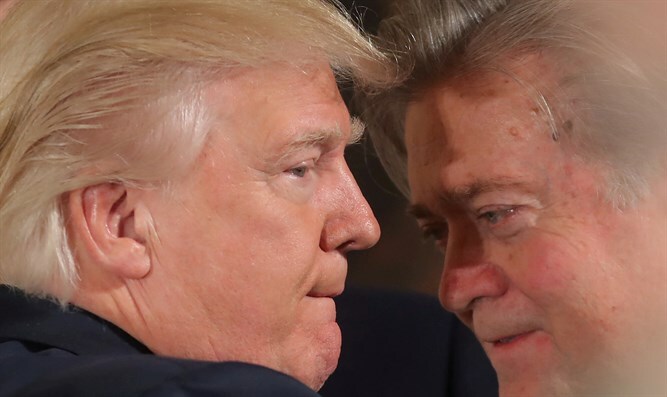 While Trump endorsed Luther Strange, who had been tapped to Alabama’s governor to temporarily fill the seat until the special election, Bannon slammed Strange as an ally of Senate Majority Leader Mitch McConnell and a member of the “Washington establishment”. Bannon instead backed former Alabama Supreme Court Chief Justice Roy Moore, who following allegations he had dated underage girls in the late 1970s, narrowly lost a seat believed to be safely Republican.